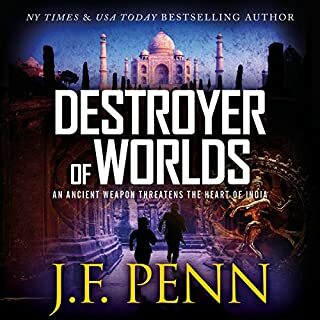 What did you love best about Destroyer of Worlds? I love the fast-paced action in this story. We are whisked from London to India and many spots between. Each scene is presented with just the right level of detail to paint a clear picture. Penn excels at this light touch with her adjectives. Morgan - readers have gotten to know her well over the previous books in this series. This work keeps her arch going. I'm not going to spoil any of the details, but you will like how she progresses in this book. Towards the end at a huge Hindu religious festival. Incredible scene, it felt like I was there with the characters. Some of the parts made my stomach turn a bit. I thought to myself, "ugh, nasty!" One thing did not happen in this book that I really wanted to happen. I'm hoping it happens in the next book in the series. I can't wait to see what Penn has in store for these characters next. If you like Dan Brown or Indian Jones, but with a lot more true facts and historical detail, this book is for your.